As an Online Service or with Our Team at Your Location! Since 1999 we have developed webcasting solutions and have together with our customers and partners, published and streamed thousands of webcasts for enterprises, governments, colleges and organizations. Our webcast teams support A / V producers, media technicians and event organizers in live streaming conferences, general meetings, lectures, web seminars and much more for you. Talk to us – and together we can realize your next live event or webcast recording. Webcast Services from A to Z. Simple video stream or complex interactive webcast: Expectations for modern webcast projects are often high. We can also successfully overcome difficulties and meet more problematic requirements. Customer support: It is often enough just to get quick tips on website integration, internet restrictions and security or networking issues. We are happy to offer such help personally, readily and at no extra cost. Online Webcast Services: Depending on certain technical requirements, we can also publish and supervise webcast productions remotely, without having to be at the event location ourselves. 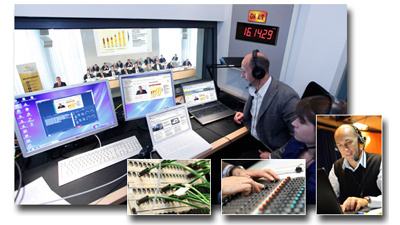 Full Service Webcast Production: Our experienced webcast consultants can produce webcasts for you throughout Europe. We turn your presence event into a video stream – available worldwide over the internet. Audio/Video production, or recording and processing of A/V signals. Signal mixing and vision control: We bring the relevant information to the forefront and combine video, presentation and more to a stream. Interactive and engaging: Get your viewers involved by allowing feedback, chat, polls, surveys etc. 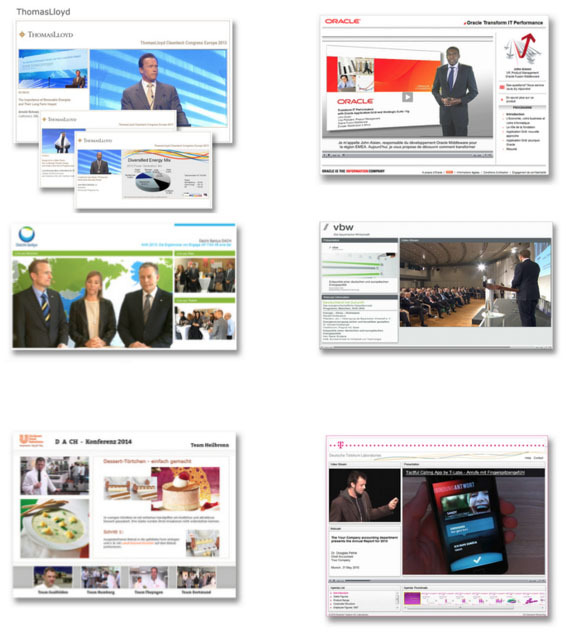 Internet/Intranet: We produce a secured stream for broadcast on the Internet and/or through your own intranet. Evaluation: You will receive extensive statistical evaluations of the number, duration and activities of your viewers. Use your existing infrastructure such as multimedia rooms, video conference systems or audio/video equipment. Often these can be used with little effort for your internet webcast productions also. We collect your media signals and channel them to our media servers, to produce your webcast via remote access and automated processes. Online – without needing to be at your location. 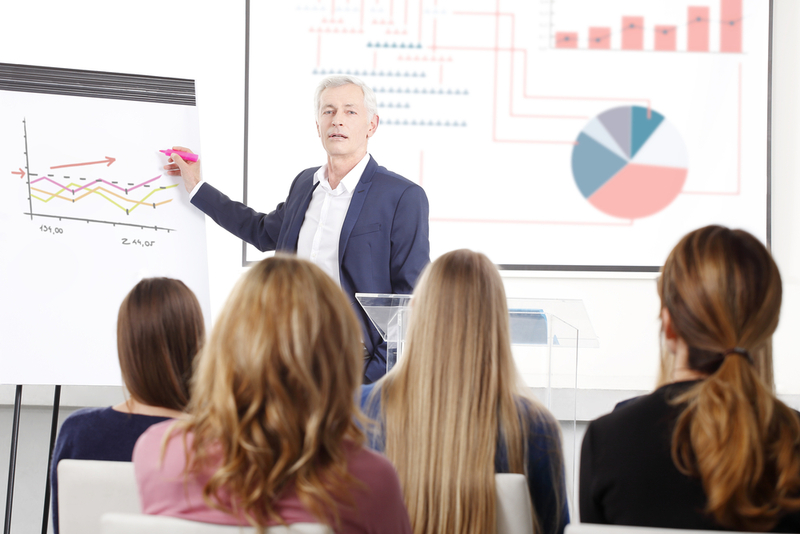 Regular events such as online training, press conferences or town hall meetings can be economically realized this way. Processing your signal: Such as streams from video-conferencing equipment, whiteboards and smartboards, projectors etc. Directoral control: From invitation management to publication controlling – before, during and after the live event. Interactive functions: Integrate and display voting, polls and other elements. Publish recordings: The video stream which was recorded on the server-side can be edited and published immediately after the event. Your own Streaming Server: If you want to take over the internal and/or external distribution of your video streams yourself, we set up the necessary servers for you and support you during operation. Player, Playout and Hosting: Everything according to your requirements in terms of design and functionality – hosted externally or integrated within your IT structure. Security and restrictive access rights: Who can access your content – when, how long and from which (geo)location. Every project is different – we’ll make yours a success!